Jim is a widowed father of three girls. Lauren is a divorced mother of two boys. When a friend sets them up on a blind date, it’s a disaster. Although Jim and Lauren eventually offer each other some helpful advice, they still don’t like each other. Then, they and their kids are surprised when they end up sharing a vacation to Africa. Will they be able to get along? This is a surprisingly uplifting, funny, and kindhearted film. Jim and Lauren both love their children. They warmly embrace each other’s children, and find fulfillment in their roles as parents. One of Jim’s daughters uses an “empty chair” technique to talk to and remember her deceased mother. Jim and Lauren both respect her need to do this. Jim tells his daughter that, before she died, his wife encouraged him to remarry, saying that her heart was big enough to love Jim and his future second wife. The film shows that children have a wide range of feelings as they struggle to accept new parental figures, and in doing so it normalizes and even smiles at those feelings. 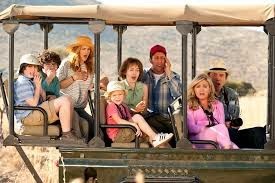 The film shows that, in new family situations, it can be difficult for the parents to figureout what each of their roles are. The film models that children are able to make room in their hearts for an extra person. Lauren’s ex-husband seems to be both pushy and negligent. He is not invested in his children. This could be difficult to see for kids who have experienced similar neglect. One of Lauren’s sons has terrible tantrums. She responds with grace, but is exhausted. Jim responds with firm redirection. Jim’s response is more effective. It seems like good parenting, but it also might seem to imply that a boy needs a father figure to get him to behave. The child’s response to Jim seems unrealistically quick and compliant. I do value that both responses seem to come from a place of love. It’s an Adam Sandler movie so there are some immature and insensitive jokes. Topics in this film that get briefly mocked are breast size, lesbians, Greek last names, and special needs. A tour guide sees a baby pig lying next to two lions. He takes the opportunity to point out that there are blended families in nature. Then, off camera, the lions eat the pig. The tour guide notes, “I may have misinterpreted that situation,” but his tour group is mortified. The situation is played for a quick laugh, but it also may connect with the fears that some children may have, that their new parents are not trustworthy and will hurt them. 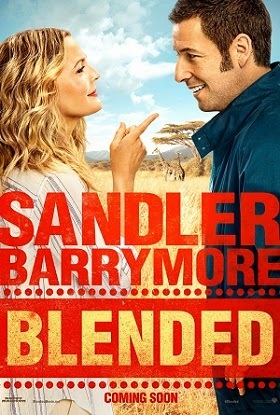 I was surprised how much I laughed, and at how much I liked Blended. I think that reaction was shared by other people in the screening as well. While some of the content makes this film more suited to teenagers and adults (and the point-of-view probably makes it mostly appealing to adults), it is warm, happy, uplifting, hopeful, generally honest and positive. I’d suggest this one as a date movie for the parents in your home. How are families formed? Is it God? Luck? Our own choices? How is adoption like a blended family? How is it different? Do you view adoption as the blending of parts of two families, or as the assimilation of one person into a new family, with no regard for their past? Are your kids able to honestly express their feelings about their experience being part of your family?